Heat 12-inch nonstick skillet over medium heat. Melt butter in skillet; add chicken, onions and seasoning. Cook 8 to 10 minutes, stirring occasionally, until chicken is no longer pink in center. Add potatoes and sauce mix (from potato box), and 2 cups water; stir well to combine. Heat just to boiling, stirring occasionally. Reduce heat. Cover and simmer 10 minutes, stirring occasionally. 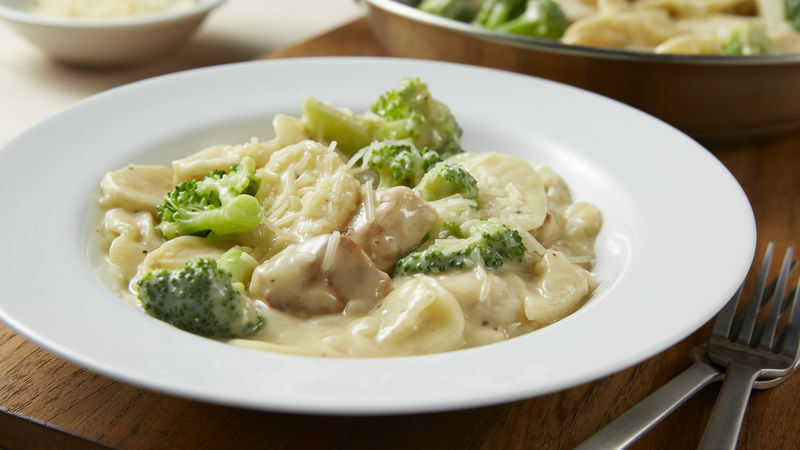 Stir in broccoli; cook 4 to 6 minutes or until potatoes are tender and sauce is thickened. Remove from heat; stir in cream cheese, and continue stirring until cheese is melted. Top with Parmesan cheese; serve immediately. Try Betty Crocker™ au gratin potatoes in this recipe instead of scalloped potatoes.